The winter weather can cause issues for your vehicle over time. Colder temperatures will cause some parts to become hard and brittle. When you drive in winter, try not to hit anything too hard or too fast. This can end up damaging or breaking parts of your vehicle. Just because you see a snow drift, you should not assume that is soft and light weight snow. The temperatures can also affect the battery of your vehicle. It will have a harder time of charging up and starting your vehicle. There also might be situations where you start the vehicle, but you will not be able to keep it running. You will want to make sure that the battery is securely positioned. If it is loose, then it can jostle around. This can also make for it to be difficult to hold a charge or keep your vehicle running. If a bracket is loose or broke, make sure to have it repaired as soon as possible. This will help keep it stable. If the battery moves too much, then a terminal or connection can be undone. The will then lead to issues with your vehicle as you drive. 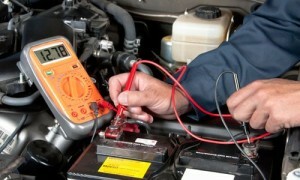 Check to make sure that the battery is free from any dirt, dust, debris, or even build up of leaves or grime. You will also want to make sure it is free of any rust or corrosion. Usually this can be found on the battery terminals. If there is, you may not be getting the appropriate charge that you would need. With age, you may also notice this happening. Anything that seems out of the norm should always be brought in so we can inspect it for you. This will help you to have a safe and reliable vehicle when you drive to and from your destination. This entry was posted in Auto Repair, battery, Battery Care, Car Care Tips. Bookmark the permalink.